The Big Island of Hawaii is an absolutely amazing place to plan a family vacation. Rent a budget timeshare here and explore an island that runs from desert to rain forest, and includes everything from coffee plantations to volcanoes. We have listed the top 5 places to visit on the Big Island to help you with your vacation planning. The Volcanoes National Park, established in 1916, showcases the results of hundreds of thousands of years of volcanic activity that has created a unique land with complex ecosystems. Visitors learn about Kilauea, one of the world's most active volcanoes, which has been erupting constantly for two decades, and about Moana Loa, the earth's most massive volcano. You'll appreciate the fact that you are in an area of active volcano eruptions when you drive the Chain of Craters Road which used to take visitors to a park entrance, but that portion of the road is now covered by hardened lava flow. And there are areas of slow moving lava that you'll be able to approach fairly closely. Puuhonua O' Honaunau, the City of Refuge on the Kona Coast, was designated a National Historic Park in 1961. It is the best preserved of Hawaii's ancient places, covering 182 acres. Visitors here not only see fascinating archeological sites, but can watch builders make out-rigger canoes using ancient methods, and enjoy exciting demonstrations of ancient Hawaiian games such as spear throwing. Parker Ranch, near Wiamea, is one of the largest working cattle ranches in the United States, covering 175,000 acres. Founded in 1847 it is also one of the country's oldest ranches. The ranch raises 30,000 Angus cattle, marketed under the Parker Ranch Angus Pride Brand label. Join a Paniolo (Hawaiian cowboy) for a fun horseback riding tour of the ranch. ATV tours are also available, as are tours of the historic ranch buildings. 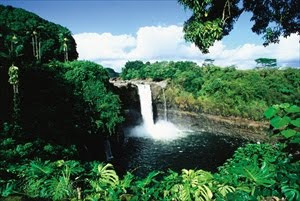 The Rainbow Falls, Waianuenue, is a stunning waterfall in Hilo. Cascading for 80 feet, it is 100 feet in diameter. The huge volume water plunges over a lava cave, and creates mists where rainbows dance in the sun. It is accessed through the Wailuku River State Park, which also contains the Peʻepeʻe Falls and an area called the Boiling Pots, a series of small falls and pools. The Kona coffee plantations are situated in the uplands of Holualoa and Moana Loa near Kona. Almost 600 coffee farms take advantage of the rich volcanic soil of this area to produce the prized Hawaiian coffee bean. In February and March you'll see the coffee trees covered in white blossoms known as "Kona Snow." In August the red coffee "cherries" begin to ripen, and each coffee tree will be picked several times between August and January, a prime time to tour the coffee plantations.